Is It Grown Up To Tell All? Last week was arguably the week of the over-share. First, you had childhood actress Mackenzie Phillips (and daughter of Mamas and the Papas star John Phillips) tell the world about her consensual sexual relationship with her father. This was followed by the uproar generated by career blogger Penelope Trunk’s revelation over Twitter that she was having a miscarriage during a board meeting. (Trunk has also blogged about a non-consensual incestuous relationship with her father. I linked to both posts on my Friday Pix last week). And fair enough. That is certainly one take on what it means to grow up: you learn to think before you speak. You learn the difference between private and public. And, especially if you’re a WASP, you learn restraint. But you could also credibly argue that in an age where the tell-all, confessional memoir has become the iconic text, what it means to grow up is precisely the opposite: coming of age means coming to the truth – your truth – and acknowledging it in front of others. We – Americans, at least – have defined adulthood in this way – as the right, even the obligation – to come clean about ourselves. So why should we be shocked when people like Penelope Trunk and Mackensie Phillips take it to its logical conclusion? I don’t have an answer to this, although – as a blogger – I think about it a lot. So I’ll throw it open to you: is it more grown up to reveal or to conceal? 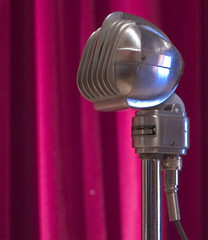 Image: Microphone by Mick Opportunity via Flickr under a Creative Commons License. Allowing for the fact that some personal revelations may be necessary either for the well-being of the teller or the public, I am tempted to ask: whatever became of privacy? Thought I just did comment, but to repeat: altho’ some revelations may be necessary for the well-being of the teller or the public (or both? ), whatever became of privacy? I’m a WASP. And I love Penelope’s posts. Even when she tells me too much. The shock of seeing those things on my computer screen. It’s my visceral reaction. Is it right? Advisable? I don’t know. I don’t know. some would argue that what makes us most individual is our secret. full disclosure gives away that last little bit and that is often too much.